Redshirt-junior Marcus Evans led the Rams with a team-high 22 points in the win over Duquesne. Photo by Jon Mirador. Men’s Basketball held on to knock Duquesne off its five-game win streak 80-74 in Pittsburgh as redshirt-junior guard Marcus Evans and sophomore forward Marcus Santos-Silva combined for 42 points. Evans played with a sprained ligament in his left thumb that was injured at a Jan. 25 practice and wore a wrap on his hand to protect it. Evans scored a team-high 22 points and three steals in the win. He was also 9-for-11 from the free-throw line at Duquesne. Santos-Silva recorded a double-double, the third of his career, with a career-high 22 points and 12 rebounds. His career-high was previously 17 points, which he recorded against Rhode Island Jan. 23. Four Rams (14-6, 5-2 Atlantic 10) were in double figures in the win over the Dukes (14-6, 5-2 A-10): junior guard De’Riante Jenkins (13), redshirt-junior forward Issac Vann (11), Evans and Santos-Silva. The Rams held on for the win after allowing eight 3-pointers in the first half to the Dukes. 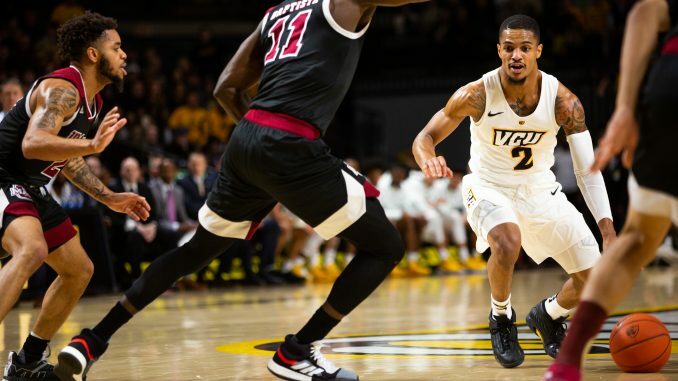 VCU held Duquesne to 0-for-10 to start the second half from beyond the arc until late in the half when the Dukes made it interesting and nailed two threes. VCU only shot 13 3-pointers, making three of them, but shot 48 percent total from the field. The contest started off very similar to the Jan. 23 loss at Rhode Island as Santos-Silva made the first four points for the Rams. VCU started on a 7-0 run to open the game as Jenkins hit an open three in transition as well. VCU held a 10-point lead early on, but the Dukes cut into it and took the lead, using a 16-0 run over a four and a half minute span midway through the first half. Duquesne’s Gavin Bizeau nailed three baskets in a row at the tail end of the run to take the lead from the Rams. Bizeau hit two 3-pointers and a jump shot from the free throw line. The Dukes held a five-point lead after the run and the Rams cut back into the lead as Vann went 4-for-4 from the line over two trips on back-to-back possessions. 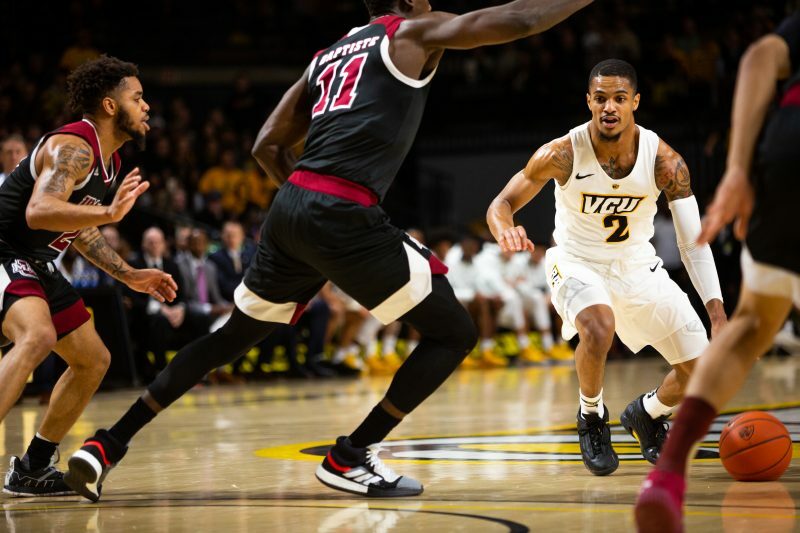 VCU and Duquesne traded blows until late in the first half when the Dukes hit back-to-back threes by Tavian Dunn-Martin and Frankie Hughes in a 24-second span. The Rams had a six-point lead halfway through the second half that was capitalized by a Santos-Silva dunk, but then he was assessed a technical foul for blowing kisses to the Duquesne fans after the slam. After Duquesne tied the game up, VCU built an eight-point lead with about three minutes on the clock. The Dukes cut into the lead once again, getting as close as four, but the Rams held on for the win. The Rams forced 17 Duquesne turnovers scoring 24 points off of the errors. VCU also out rebounded the Dukes 45-29 in the contest. The Rams will return to the Siegel Center Feb. 2 to host George Mason at 6:30 p.m. on NBC Sports Network.